Comments: Evergreen tree native to coastal parts of Australia. Lavender to purple spiked flowers that surround the branch and pea sized woody seed pods are indicative of this plant. Mature height to 15' in native environment. Leaves are 2" to 3" long and terminate in a point. 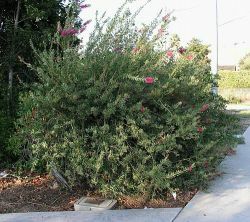 This plant is a cultivar of the red bottlebrush.